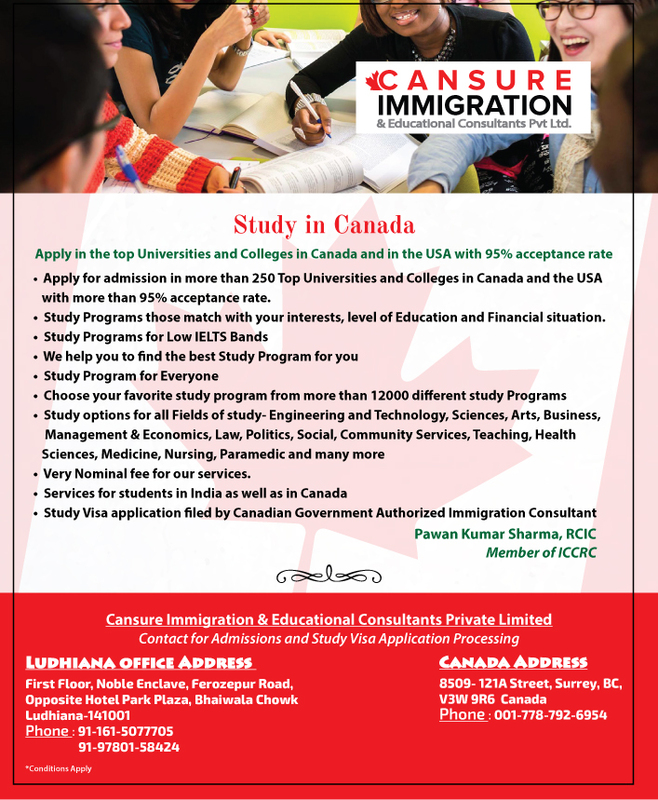 CANSURE IMMIGRATION & EDUCATIONAL CONSULTANTS PVT LTD.
Good news! Canada has announced 2,85,000 openings for the year 2015. Nurses, Engineers, Computer Professionals, HR professionals, Health Practitioners etc, are few of the listed occupations. Do you need a Canadian Visitor Visa? Most visitors to Canada are granted six months from the date of their arrival. The visitor is then expected to leave on or before the end of the six month period. In the latest MPNP draw for skilled workers, 250 candidates were issued a Letter of Advice to Apply (LAA) under the criteria for the Skilled Workers in Manitoba sub-category. Mr. Pawan Kumar Sharma has been very proffessional and patience through the whole Super Visa application process. I deeply appriciate his commitment in my case.I highly recommend his services to anyone. I would like to thank Mr.Pawan Kumar Sharma, director Cansure Immigration & Educational Consultants Private Limited for taking care of everything from preparation to submission of my application for Super Visa to Canada. My visa application was already 3 times refused from other consultants but approved from Cansure Immigration. I would like to thank Mr. Pawan Kumar Sharma, director Cansure Immigration & Educational Consultants Private Limited for taking care of everything from preparing to submission of my visitor visa application. I would like to thank Mr. Pawan Sharma, director Cansure Immigration & Educational Consultants Private Limited for taking care of everything frompreparing to submission of my visitor visa application.He submitted my visitor visa application and my visitor visa was issued on November 08, 2017. I would like to thank Mr. Pawan Kumar Sharma, director Cansure Immigration & Educational Consultants Private Limited for taking care of everything frompreparing to submission of my Study visa was issued in 10 days on April 06,2018. I would like to thank Mr. Pawan Kumar Sharma, director Cansure Immigration & Educational Consultants Private Limited for taking care of everything from preparing to submission of my visitor visa application. He submitted my visitor application on March 19, 2018 and my visitor visa was issued on March 29, 2018. I would like to thank Mr. Pawan Kumar Sharma, director Cansure Immigration & Educational Consultants Private Limited for taking care of everything from preparing to submission of my visitor visa application. He submitted my visitor visa application on February 22, 2018 and my visitor visa was issued on February 27, 2018. I would like to thank Mr. Pawan Kumar Sharma, director Cansure Immigration & Educational Consultants Private Limited for taking care of everything from preparing to submission of my visitor visa application. He submitted my visitor visa application on February 22, 2018 and my visitor visa was issued on February 27,2018. I would like to thank Mr. Pawan Kumar Sharma, director Cansure Immigration & Educational Consultants Private Limited for taking care of everything from preparing to submission of my visitor visa application. He submitted my visitor visa application on March 05, 2018 and my visitor visa was issued on March 22, 2018. I would like to thank Mr.Pawan Kumar Sharma, director Cansure Immigration & Educational Consultants Private Limited for taking care of everything from preparing to submission of my restoration of status and open work permit application. © 2018 Cansure Immigration. All Rights Reserved.